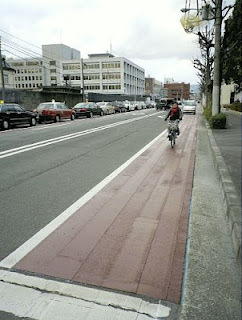 Kyoto re-paints bicycle lanes brown. The highly traditional Japanese city of Kyoto has re-painted all of its formerly blue bicycle lanes to brown after locals complained that the blue was too bright and clashed with the traditional nature of the ancient city. 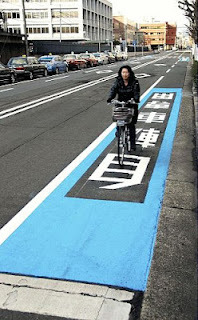 While bright blue is the color recommended for bicycle lanes nationally by the National Police Agency, it is well known that businesses such as convenience stores and fast food outlets that operate under company colors around Japan do in-fact subdue their the colors of their outdoor advertising in Kyoto in order to maintain the traditional image of the city. While the brown color does fit more closely with the aesthetics of the city, it is obviously not as visible as a bright blue bicycle lane, but urban planners realise the need to cater for the needs of cyclists while maintaining the city image. What do you think of this decision to camouflage bicycle lanes? Simply wish to say your posting is as surprising. The clarity inside your publish is just nice.Thanks a million as well as please keep on the great function.